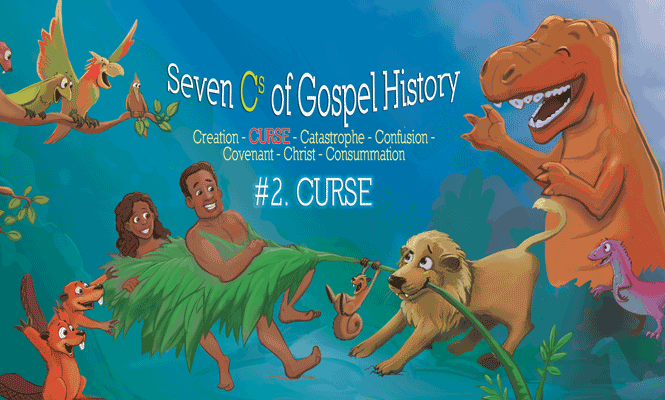 The Seven Cs of Gospel History are Creation, Curse, Catastrophe, Confusion, Covenant, Christ, Consummation. They tell us God’s plan for the world and for us. 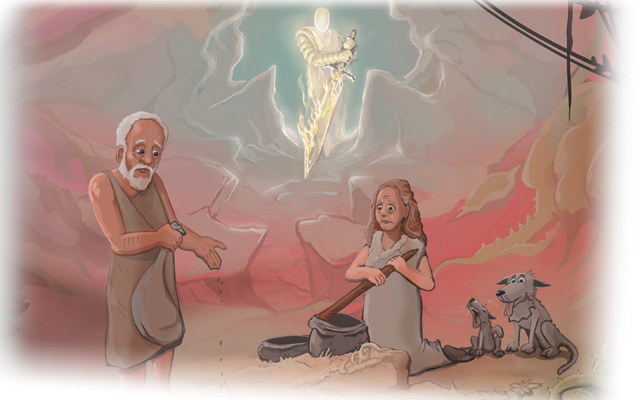 Adam and Eve greatly enjoyed living in their lovely garden home called Eden. They had lots of delicious fruit and nuts and other nice things to eat. And lots of friendly animals as pets. Think of what it might have been like to pat a tame T. rex. But it didn’t last forever. 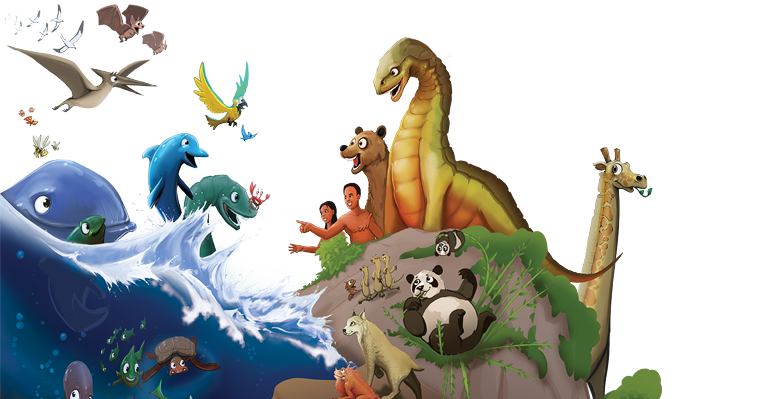 When God created Adam, He gave him just one rule: Adam could eat anything in the garden except the fruit from one tree called the Tree of the Knowledge of Good and Evil. God warned Adam that if he did this he would die. The fruit wasn’t poisonous; death would be the penalty for disobeying God. Until then, Adam and Eve hadn’t done anything wrong. But if they ate the fruit from this tree, they would be disobeying God, Another word for this is ‘sin’. God wanted them to choose to love Him, and so He gave them a choice. The tree was a test. Did they love God enough to choose to obey Him or not? Eve replied that they could eat the fruit from any tree in the garden except one. And she added that God had said they must not even touch it. Now God hadn’t said anything about not touching the tree. So perhaps it was Adam’s own warning about not touching it. Satan said to Eve: “You won’t die. God knows that when you eat that fruit you will be like Him, knowing good and evil.” But Satan was lying. He is the enemy of God, and tries to get people to disbelieve in God, by denying what God has said. The very first temptation of anybody in the whole world was for Eve to doubt the truth of what God had said. Today Satan casts doubt on what God says in the Bible, and what the Bible says about God. This is not only about what is right or wrong, but even denying that God is our Creator. One way Satan does this is by means of the idea of evolution, which says that everything in the universe made itself without God. But God does exist, He is our Creator, and in the Bible He gives us the rules He wants us to obey. These include telling the truth, obeying our parents, and treating other people the way we want them to treat us. Breaking God’s rules is called ‘sin’. If God didn’t exist, there would be no such thing as sin, and we could decide for ourselves what is right and wrong. And if there were no such thing as sin, then God couldn’t ever ask us why we hadn’t kept His rules. Nor would we need a Saviour from sin. Eve inspected the tree. It really was beautiful, and the fruit did look delicious. She thought how nice it would be to be wise, like God. She picked a piece of fruit and took a big juicy bite. Then she gave some to Adam, and he took a big juicy bite too. Alas, the result was not what they expected. They suddenly realized that they had disobeyed God. And now they knew and felt the difference between good and evil. They felt guilty and ashamed. This was not the marvellous result that Satan had promised. It dawned on them that God had not lied to them, but Satan had. Sin is always like this. We think we will enjoy doing something we know is wrong, but then we find that it causes us shame and regret. Adam and Eve were now afraid to meet God. Later that day, God came to the garden. Uh-oh! Adam and Eve hid from Him among the trees. This didn’t do any good, because no one can hide from God. God called, “Where are you?”—not because He couldn’t find them, but because He wanted them to come out on their own. Instead, they were ashamed to come out and meet Him. So God said, “Have you eaten the fruit I told you not to eat?” Of course, God knew what they had done, but Adam and Eve didn’t own up to their sin. Instead, they each tried to blame someone else. Adam said to God, “The woman you put here gave me the fruit and I ate it.” Adam wasn’t only blaming Eve, but also God, for making Eve for him. Eve, in turn, blamed the snake which Satan had used to speak to her. Because God is holy and just, there is always a penalty for sin. God told Adam that the ground was now under a curse. Weeds and thorns would now grow in it. And Adam would have to dig the ground and work hard all his life to produce food to eat. And the worst penalty of all was that he would die, as God had warned, and his body would return to dust. God told Eve that because of what she had done, she would have increased pain in giving birth to children. But her daughters (and their daughters) would still want to have husbands. We are all descended from Adam and Eve. And because Adam and Eve chose to obey Satan instead of God, we all do the same. We are all born wanting to sin, instead of wanting to do what is right. God still loved Adam and Eve, just as He loves you too. So God gave them (and us) a promise in the form of a prophecy against Satan. One of Eve’s descendants, the Lord Jesus Christ, would one day come and live here on Earth. He would defeat the work of Satan by paying the penalty for our sin by dying on the Cross and then rising to life again. This happened about 2,000 years ago. 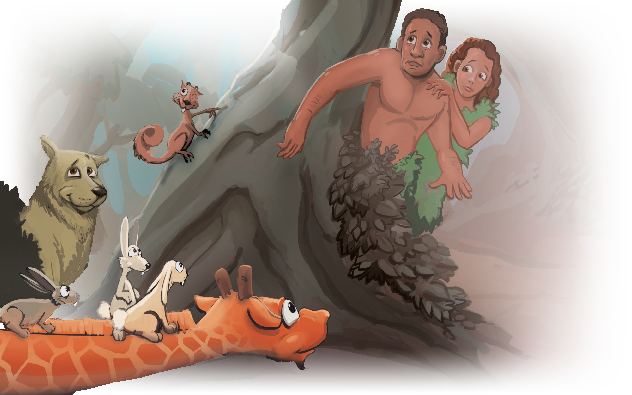 The Bible tells us that God made clothes out of animal skins for Adam and Eve, to replace the fig-leaves they had put on when they tried to hide from Him. So at least one animal must have died—because of their sin. Finally, God put Adam and Eve out of the Garden of Eden. This was so they would not eat from another tree there called the Tree of Life. If they had done this, they would have lived forever in their sinful state. God put an angelic guard there to stop them from ever returning. From that day on, Adam and Eve no longer had their special relationship with God. And their bodies began to die, just as ours do today, even though they would live on for many more years. But as we now know, Jesus said: “Whoever believes in Me, though he die, yet shall he live (John 11:25).